Rose is from Haiti and she came to Brazil under a special humanitarian visa program. She now has permanent residency and couldn't be more grateful! 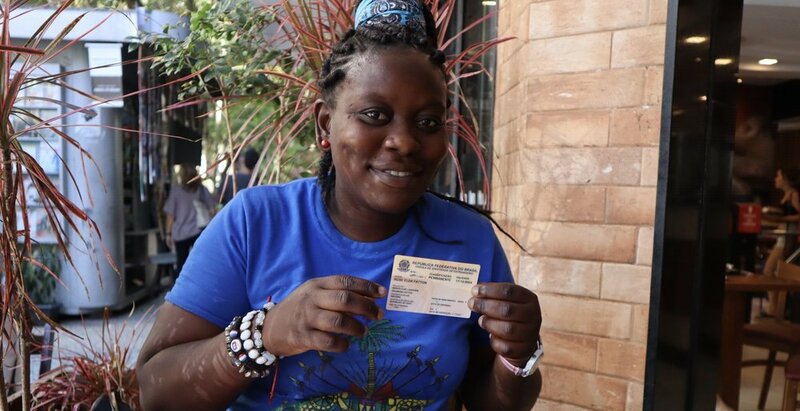 Here she is holding up her Brazilian permanent residency card. Rio de Janeiro, 28 April 2018. I've been learning about Brazil's special humanitarian visa program for Haitians. I believe if Australia took a leaf out of Brazil's book we could prevent people smuggling, without resorting to abusing people seeking asylum. There are a lot of reasons why people may feel compelled to leave their country. Some fit the very strict definition of a “refugee”, others flee general violence or are stateless. And many flee for a combination of security and economic reasons. The people of Haiti fit into the latter category, for the most part. After the shocking earthquake in 2010 Haiti was in disarray. The country was already one of the poorest in the world, and the disaster left it decimated. All functions of government were impaired (who can forget the ruined Presidential Palace), crime and insecurity erupted, exploitation and abuse were rife. Haitian people began searching for options inside the small country and found there were few. Many looked abroad for solutions to their plight. They started moving towards Brazil in large numbers, many with assistance of people smugglers. Often they took dangerous routes via other South American countries, at risk of trafficking and abuse. They were being received in small towns and cities in Brazil’s north which were ill-equipped to handle them - and it was putting strain on social services. So Brazil faced a choice. Turn their backs on the Haitians, or give them a safe and legal path to come by. Brazil chose the latter. In 2011 Brazil has been issuing permanent humanitarian visas to Haitians (similar to Brazil’s special humanitarian visa program for Syrians). The main difference to the Syria program is that Haitians can apply from inside their own country - from the capital, Port-a-Prince. The visas allowed Haitians to come to Brazil, work and access social benefits such as health and education. Since 2015 the International Organisation of Migration (IOM) has been running a special visa processing centre in Port-a-Prince to assist the Brazil Government with applications. On my way into UN House, Brasilia, to meet with IOM, 4 May 2018. The only way of avoiding the problems we were having in the northern border of Brazil - with a huge migration flow from Haiti, collapsing small cities, lots of problems with irregular migration and all the criminally that goes around it - was to provide a legal pathway for migrants. We are very proud that this program basically ends irregular migration. Brazil has welcomed more than 85,000 Haitian people through this humanitarian pathway, whilst managing the flow of people in a way that mitigated stress on the Brazilian community. Thousands of Haitians now have permanent residency and are valuable contributors to the Brazilian economy. People like the dynamic and lovely Rose - who told me because of the program “now I can say I am free”. Rose came to Brazil under a special Haitian humanitarian visa program. Here's a little interview with Rose standing outside Caminhos Language Centre in Rio de Janeiro, where she learnt Portuguese. What can we learn from Brazil’s experience? On 9 April 2010 the Australian Government, under then Prime Minister Kevin Rudd, suspended the processing of Sri Lankan and Afghan asylum applications. This was a knee jerk reaction to an increase in asylum seekers coming from both countries - linked to the horrific conclusion of the Sri Lankan civil war in 2009, and the fierce conflict taking place in Afghanistan (which Australia was actively involved in, I might add). I won’t mince words - the suspension was completely stupid. It resulted in major backlogs of asylum applications, swelled Australia’s immigration detention centres, fuelled the perception that Australia’s asylum processes were getting out of hand, and did absolutely nothing to stop people smugglers peddling their false hopes of a brighter future in Australia. But imagine if Australia took a different path. Just imagine if instead of suspending applications, Australia took a proactive decision to start taking asylum applications from inside Afghanistan and Sri Lanka (or Pakistan and India as neighboring countries of first asylum, respectively). What person in their right mind would trust a people smuggler to get them to Australia, over an official at the Australian Embassy? By creating a safe and legal pathway from Afghanistan and Sri Lanka to Australia, I believe we could have prevented thousands of asylum seekers from risking their lives at sea after 2010. Alas, Australia did not even canvass this option. Rather than facilitate managed migration, we reverted straight to deterrence - at a significant cost to us financially, and ethically. We are still paying that price today, with thousands of people seeking asylum still warehoused on Nauru and Manus Island. The history books will not look kindly on what Australia has done to these people. You have to accept that people won’t stop migrating. If we provide a legal pathway, we have people migrating in an orderly way.